With summer around the corner, it’s time to let your hair down, get some highlights and enjoy the carefree lighter side that comes with warm weather. Here are some of our favorite choices to enhance that natural summertime glow. One of Manhattan’s favorite hair salons just got a beautiful revamped look. 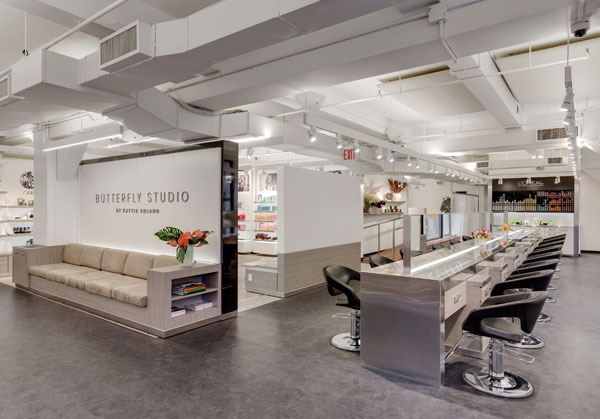 In 2001 Kattia Solano opened the Butterfly Studio Salon, which grew quickly over the years and landed them in their current airy loft space in the Flatiron District. Known for transforming their client’s hair to reflect the current trends and also incorporate their busy lifestyles, Butterfly Studio Salon has been the go-to destination for models, A Listers and other chic New Yorkers in the know. After a complete gut renovation, the updated salon area is warm and inviting, utilizing every source of natural light offered, amplifying true hair color and every beauty detail to review and showcase their best work. This modern, downtown space fuses natural elements with elegance, cultivating an environment their clients look forward to visiting and being pampered. In addition to updating the way they look, the salon has also revised their menu with service options to fit that modern, on-the-go Manhattan client. One of their most popular options is the Paint Bar, a fantastic means to tweak your look or intensify your color around your face, add some summer highlights or cover the grays in just 20 minutes. As summer is coming, get ready for that dewy summertime glow with a laser facial. In just 15 minutes your skin will be transformed with no downtime and immediate and long-term effects. The Shobha laser facial is an innovative treatment that uses the heat from the laser to build collagen and minimize fine lines from beneath the dermal surface. This deeply cleanses the skin while tightening pores, and reduces rosacea and sun spots while evening skin tone. With four locations throughout the city, busy New Yorkers can conveniently get a quick pick me up before jetting off to your summertime destination.